Salt and sugar go together like coffee and cream — each brings the other to new heights. 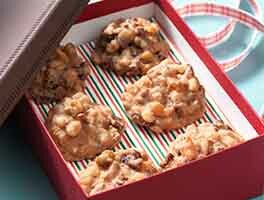 These butterscotch cookies are heavily laced with toasted pecans and butterscotch chips. Love salty/sweet? They're rolled in a mixture of sugar and salt before baking, which gives them over-the-top flavor. There are a few of options once you have the dough made. 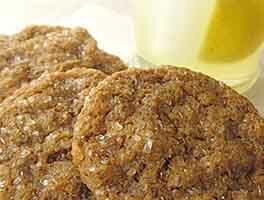 If you bake the cookies right away, you'll have a flatter, lighter-colored cookie. Refrigerate it for 4 to 5 hours, the cookies will be flat, but not "puddle-y." Chill overnight, and the dough dries out, with some of the starch in the flour turning to sugar. The cookies will be darker, more "caramel-y," and won't spread nearly as much. Also, these cookies are a good candidate for the "tablespoon vs. teaspoon" scoop choice. A tablespoon cookie scoop (actually 4 level measuring teaspoons) will yield big, 3" cookies; a teaspoon scoop (1 3/4 level measuring teaspoons) will make smaller (2 1/4") cookies. 34 mins. to 20 hrs 40 mins. *If you're making smaller (teaspoon cookie scoop-sized) cookies, increase the coating to 1/2 cup (3 1/2 ounces) granulated sugar mixed with 1 3/4 to 2 teaspoons salt. Preheat the oven to 375°F. Lightly grease (or line with parchment) two baking sheets. Place the pecans in a single layer in a pan, and toast until they've darkened a bit and smell toasty, about 8 to 9 minutes. Set them aside to cool, then chop coarsely. In a large bowl, combine the sugars, butter, shortening, salt, espresso powder, baking soda, vanilla, flavor, and vinegar, beating until smooth and creamy. Beat in the egg, again beating until smooth. Scrape the bottom and sides of the bowl with a spatula to make sure everything is thoroughly combined. Mix in the flour, then the chips and toasted nuts. If you're going to refrigerate the dough, cover the bowl, and refrigerate for about 4 to 5 hours; or overnight. Cookie dough refrigerated for 3 1/2 to 4 hours will spread moderately; chilled overnight, it will spread much less. Mix the 1/3 cup sugar and salt for the coating, and put it in a bowl. Use a spoon (or a tablespoon cookie scoop) to scoop 1 1/2" balls of dough into the sugar/salt mixture, rolling to coat. Then transfer to the prepared baking sheets, leaving 2" between them on all sides; they'll spread quite a bit. Or use a teaspoon cookie scoop to scoop 1 1/4" balls of dough. 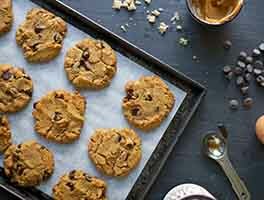 Bake the cookies for 10 to 11 minutes — 11 minutes for smaller cookies, 12 for larger ones. Their edges will be chestnut brown and their tops a lighter golden brown. (For dough that's been refrigerated, add 30 seconds to 1 minute to those baking times.) Remove them from the oven, and cool on the pan till they've set enough to move without breaking. Repeat with the remaining dough. Yield: about 4 dozen 3" cookies, or 7 dozen 2 1/4" cookies. The sugar-salt coating can be made more or less assertive, your choice. Use the lesser amount of salt for a less adventuresome audience; the greater amount for those who love the salty/sweet experience. 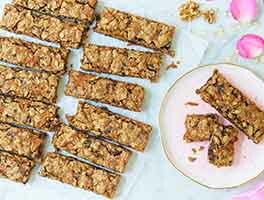 It's easy to make some of both; just divide the dough in half, and make the coating both ways, rolling half the cookies in the saltier coating, half in the milder. I thought these cookies were alright. If you love sweet things (really really really sweet), then you'll love these. I'd never had butterscotch before, so I wasn't sure what to expect, but I do love salty sweet thing. these were the last batch of cookies I made to give away this year, and I had to rush to get some made so my daughter's bus driver could have some with cookies we were giving her. So I made a tray of six, right away, so they would have time to cool before drop off. They spread quite a bit which I had expected, and smelled amazing. I once they were cool, I stole one for myself to try, and put the rest away for the bus driver. I loved the crisp texture, and the hint of salt from the coating. I really liked the nuts too. However they were very very very sweet, and I suspect maybe thats from the butterscotch chips. So sweet that one cookie made me feel pretty sick. Which is my fault for finishing it, knowing I dont have that big of a sweet tooth. 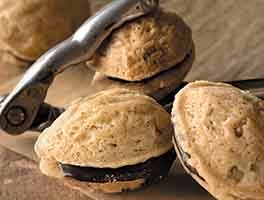 I'm wondering if there is a similar cookie on this site thats maybe a little less sweet, but has a nice crispness and flavor. Hopefully the people I'm giving these away to, have sweet tooths. I made this once as written. Then, I made some changes. I wanted less butterscotch pecan, and more butter pecan. I do a little prepping before actually starting the dough. First, I used all butter, no shortening and browned the butter with the toasted pecan pieces in it. This added depth to the butter and really kicked the nutty flavor up a notch. I removed the pecans to a bowl using a fine slot spoon. I added a splash of spiced rum to the pecans, and let them just chill out together while my brown butter chilled in the fridge. At this point,I make the cookies, as written minus the flavoring I have already added to the pecans and I completely omit the butterscotch chips from the recipe. That said, when they are done, I melt the chips, and lightly drizzle the cookies and hit that with flaked salt. Amazing! Have made this recipe for quite a few years now, it is a holiday "must have" in our family! Have made it with butterscotch, butter-rum and butternut flavoring, the butternut is our favorite but all of them are very good. I do chill the dough if I have the time (so nice to have cookie dough made and ready to go while you finish yet another task!) although no negative issues working with the dough and baking immediately after mixing if necessary. Breaking up the toasted pecans slightly before adding them at the final mix helps achieve a more uniform dispersal of the nuts. A cookie scoop makes short work of portioning out the dough. I make triple batch every Christmas, have to freeze them or give them away immediately though- they are irresistible! I have baked this recipe, multiple times. I did make some adjustments though. we love salted caramel and thought these could be baked as salted caramel. I bake 1 1/2 recipe using only butter. I use Ghiradelli caramel chips, caramel flavoring, tourbo/raw sugar and a flakey salt. The cookies are incredible. This recipe is THE new family favorite. Thank you, King Arthur Flour. These are cooling right now in kitchen. I have to go guard them. The guy who loves butterscotch loved these and called them amazing. I thought they were too sweet and will cut the butterscotch chips by 1/2 next time. These cookies were very good but will be better next time I make them. They were a little too crisp, not as salty and a bit sweeter than I'd like. My modifications: 1) Cut granulated sugar in half as suggested. 2) Did not have espresso powder so left that out. 3) Used rum in place of the suggested flavorings. 4) Substituted toffee bits for butterscotch morsels. 5) Used the lower salt option for the sugar coating. 6) Shaped the cookies into balls using small cookie scoop, refrigerated them overnight and rolled in sugar-salt mixture before baking. 7) Baked for 10-12 minutes I baked two trays at a time swapping them half way through. I mistook the melted toffee bits for undercooked cookie dough will take them out sooner next time. Will use pecan pieces instead of halves so there is pecan in every bite. Wondering if omitting the espresso powder is why the cookies are still on sweet side even with 25% less sugar. Any thoughts on using cocoa as a substitute for the espresso powder? Spread a little more than I'd like, might add more pecans. Will use more salt in the sugar salt mixture. I can't say these were a success. I followed the recipe carefully, chilled the dough for 3 1/2 hours, and baked for 11 minutes (first batch) and 10 minutes. I found the dough VERY difficult to work with---very crumbly and hard to form into balls, and the end product was very crisp, rich, and SWEET! God these are sweet! They're supposed to be salty and sweet, but I don't get anything but sweet off of these. Rolling them in the salt-sugar combo just sent them over the top; nobody liked them. I don't think I'll be going through the hassle of making these again. These cookies are fabulous! Great flavor and texture and easy enough to make. King Arthur recipes are always my go to when I want to try something new or make something special for an event. I made these cookies with my 10-year-old niece when she came to visit. We were halfway through the recipe when I realized I didn't have any AP flour. I didn't want to stop and go to the store so I decided to use white whole wheat flour that I had on hand. I was hesitant because I usually only use it for breads. They turned out crispy and delicious. They were not hard or tough as I had feared with using the white whole wheat flour. The cookies were almost like a firm shortbread and I think the nuttiness of the WWW flour may have enhanced the flavor. I reduced the flour from 2 cups to 1 1/2 cups and it seemed perfect. I used the greater amount of salt with the sugar for rolling. Thank you King Arthur for another amazing recipe! I think these are entering my holiday cookie baking. They're delicious! I'm not the biggest butterscotch fan so I will probably trade those chips out for toffee brickle and see what that's like. I may also use flake salt to signal the salty sweet flavor. I'm thinking about rolling them in sure then sprinkling flake salt. In any case, thank you for this amazing recipe! 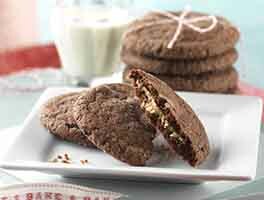 These cookies are a great basic base for adapting to your own tastes. I loved the salty-sweet combination they provided. I took some of these in to work and they disappeared quickly. Personally, I'm not a fan of butterscotch, but I would absolutely make these cookies again substituting in some dark chocolate chunks, toffee, or caramel if I were making them for myself. If I were taking them somewhere I would probably leave the butterscotch chips in because everybody else really liked them.